Amy Averett and her family have been involved with Creative Action since her son Walter experienced our interactive performance, Courage to Stand, in the fourth grade. 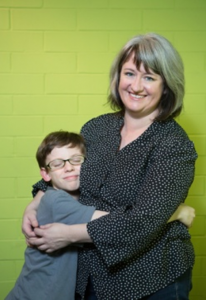 Through camps, after school programming, and – currently – our Changing Lives Youth Theatre Ensemble, Amy, her son Walter, and their family have remained strong supporters of our mission. This is her story. 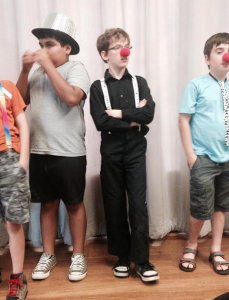 My son Walter has been involved with Creative Action since early elementary school. Walter would be an easy target for bullies – he’s a self-professed nerd complete with glasses falling off his nose, food on the front of his shirt and a desire to talk to you AT LENGTH about Lord of the Rings. He has epilepsy, which resulted in brain surgery at age 8, ADHD, and a noticeable stutter. So yeah, he pretty much fits the stereotype of the kid most likely to get crammed into a locker. I remember when Walter came home from Maplewood Elementary in 4th grade telling me about the Courage to Stand program – an interactive classroom performance where two actor-teachers take students on a magical journey through history to learn about courage, how to stand up, and what it means to be an ally to someone being bullied. He insisted that I come to school to watch one of the performances, which I did, and I fell in love with the work Creative Action was doing. After that, my family became “power users.” He attended camps every summer, producing TV shows, dancing, drumming (and can I just say that there is a special place in heaven for people who willingly give drumsticks to children) and learning all facets of comedy, as you can see in this photo. He also attended Creative Action’s after school program at Maplewood for a number years. I knew that the staff really knew Walter and they were rooting for him. And although Creative Action isn’t specifically tailored for kids with disabilities, they accepted him with all of his quirks. I knew I was sending him to a program where he would be safe, both physically and emotionally. Now that he is in high school and a little too old for camps, I twisted his arm to go to the Changing Lives program auditions. Sometimes it’s hard for Walter to work collaboratively within a group – his stutter and impulsivity require some patience. The Changing Lives directors Noah and Meg have worked hard to make the group fully inclusive for kids like Walter who might struggle to fit in. The kids in Changing Lives receive a stipend for their work, so Walter considers this his job. I can see the pride when he tells people he has to “go to work tonight.” It’s a big deal for a teenager with a stutter to get up and perform in front of other people, much less middle school students, but he did just that this week through Changing Lives. All along the way I’ve been grateful. Grateful that Creative Action helped create a bully-free environment at school. Grateful that Walter could get on stage with confidence. Grateful that the acceptance he experienced at school and camp translated into self-acceptance throughout middle school. And with the heightened focus on sexual harassment and assault, I’m incredibly grateful that my teenage son is learning about healthy communication and relationships through Creative Action and sharing that message with others (because believe me, he doesn’t want to talk about it with his mom!). As for Walter, he says the biggest benefit for him has been the great group of friends he’s made. Before joining Changing Lives, he says, he didn’t know if one person could make a difference. Now he sees the difference the group has made for thousands of middle schools students. Walter also said that the program has changed his career plans. Rather than being a video game designer, he now hopes to work at Creative Action running teen programs like Changing Lives. Knowing that Creative Action works with thousands of “Walters” throughout Central Texas gives me tremendous hope for our community and kids. Our family has been fortunate that we could afford after school and summer camp enrichment programs like Creative Action – but so many families cannot. There’s nothing I wouldn’t do to support these incredible artists and activists.